The addition of a curved section to the initial steps of this cantilever glass stairs is a particularly beautiful element to our most popular and visually striking stairs. This cantilever floating stairs with its open rise steps demands your attention while filling a hallway with a sense of light & space. All Signature Cantilever glass stairs are designed for use no matter what the build construction, from 'Renovations' to 'New Build'. The structural success of any cantilever glass stairs depends on the strength coming from the wall side of the steps. Over the years our structural partners have formulated solutions to ensure all our cantilever stairs are solid underfoot no matter the site environment. Forward planning is the key to this success, so don't be afraid to discuss your plans with us at the early stages of your project. Certain house plans and hall layouts do not always allow for a cantilever stairs to run adjacent to a wall for its' entire length. The above glass staircase design is the cantilever solution to this very issue. The stairs still gives its spectacular floating staircase effect and there is a seamless transition from the initial flight to the upper section. Balustrade: double-sided frameless glass stairs balustrade to the lower flight and single thereafter. As with all Signature Stairs metal structural Cantilever frames, the support for this glass staircase is cleverly hidden behind the plasterboard finish. The metal structure of the stairs is installed early in the build process and once concealed Signature Stairs then return to fix solid timber step cladding and balustrades at the appropriate time (nearer the end of your project). In this project there were four individual Cantilever glass stairs flights, each with differing support walls. This demanded four different methods of installation to produce what is a spectacular centrepiece to a modern design home. This Signature Stairs project illustrates just how best to utilise the benefits of the Cantilever floating stairs design. The open rise steps add visually rather than take away from the available space. As well as the 'WOW' design factor these Cantilever stairs give depth to the hallway which would otherwise be lost to a solid construction traditional type stairs. The frameless glass balustrade used in all our cantilever glass staircase designs is clear toughened glass which conforms, and in most cases exceeds, building & safety requirements. Finished here with brushed finish circular stainless steel fixings to the side of the step, we can also offer the option of concealing all fixings with a solid timber cover which matches the step (see previous pictures). We offer a wide range of handrail options for our Cantilever glass stairs design - from 'stainless steel round profile' or rectangular sleeve handrails' to the 'square finish' solid timber handrail used in this project. Our joinery partners use natural solid timbers to beautifully form our steps and handrails. Clients are free to choose form a myriad of timber choices for the Cantilever stairs. Each step has has a minimum of 20 mm solid timber to the top, front & back of the step and is finished with a subtle rounded nose edge and professional grade, low sheen lacquer. Our attention to the minute details is what distinguishes a Signature stairs from others. With floating steps, an open rise and glass balustrade the client has utilised the cantilever stairs design to maximise a sense of openness and light in his hallway. Clever structural engineering enabled a seamless change of direction through the quarter landing towards the top of the stairs. 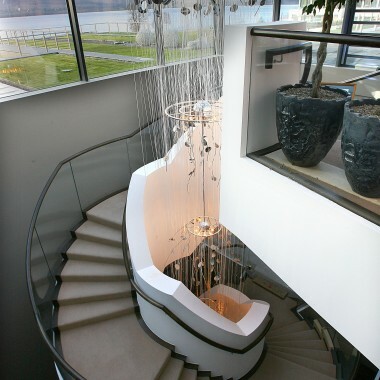 Stunning Cantilever staircase design (14 steps / 15 rises) that makes the best use of a narrow space. The light source from above flows through the living space and this is enhanced with the use of a glass floor at the return landing giving the illusion of more depth and space. The steps are clad in high grade American White Oak stain finished to match the interior. The balustrade is toughened safety glass. Signature stairs specialise in providing Cantilever glass stairs that add a dramatic touch to any home. Our Cantilever Stairs are a stunning feature glass stairs and represent an impressive combination of spectacular visual impact and engineering expertise. With steps that appear to seamlessly float from the wall and finished with glass balustrade this floating stairs is truly breathtaking. 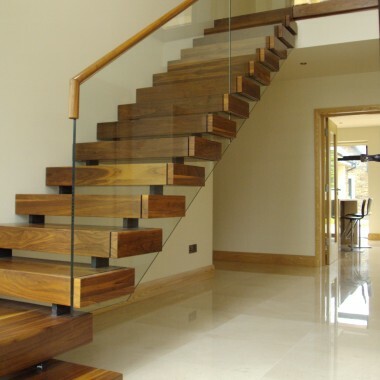 Glass stairs are an excellent solution to limited natural lighting issues and are ideal for illuminating interiors. Open plan living spaces create a sense of luxury and architects are increasingly using glass stairs to achieve the illusion of more space & light. Each Signature glass staircase is produced using building compliant clear toughened glass and you can choose from a variety of handrail options. The floating stairs are visually stunning and the lack of visibile support gives the steps of the Cantilever stairs their impressive floating effect. With no visible support, open rise steps, glass risers and ‘Free Standing Glass’ balustrade this glass staircase will make a wonderful impression in your home. The Cantilever Stairs is further enhanced by additional ‘free standing glass’ guard rail on first floor level which will maximise the use of natural light to the stairwell. As per building regulations the structure has minimal deflection and feels solid to walk (unlike some modular counterparts) on. The Cantilever stairs can be installed in a number of different ways but the earlier it is included in your build schedule the easier it is to avoid potential structural problems and the more economical it will be to install the glass staircase. The glass stairs may be finished with either stainless steel or timber plates to the outside of balustrade. 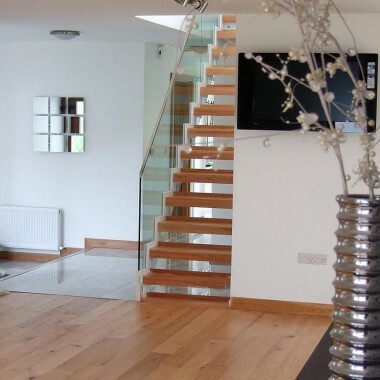 Handrails can be top fixed or floating from the glass, in either timber or stainless steel. 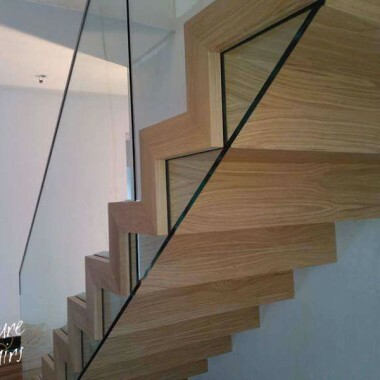 Our glass stairs are available in a myriad of timber finishes – the steps and handrails are finished lacquered and installed by specialist joiners.